Schlock-Wire: Grindhouse Releasing Fires Up THE BIG GUNDOWN On Blu-Ray And DVD In December – Schlockmania! Grindhouse Releasing Presents THE BIG GUNDOWN! 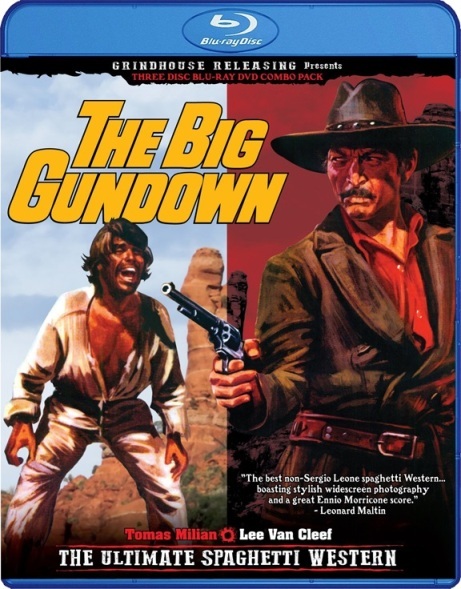 LOS ANGELES – Grindhouse Releasing is proud to present the first-ever U.S. home video release of the greatest Spaghetti Western you’ve never seen: Sergio Sollima’s widescreen epic THE BIG GUNDOWN! – Spectacular new 2K digital restoration of the uncensored English-language version NEWLY EXPANDED WITH THREE ADDITIONAL SCENES! – BONUS Blu-ray disc – LA RESA DEI CONTI – the complete, 110-minute director’s cut presented in Italian with optional English subtitles and special musical subtitles. – Extensive still galleries, trailers, and TV spots… AND OTHER SURPRISES! Grindhouse Releasing’s Blu-ray/DVD editions of AN AMERICAN HIPPIE IN ISRAEL and CORRUPTION are available now. Upcoming Blu-ray releases include Frank Perry’s THE SWIMMER, starring Burt Lancaster, and S.F. Brownrigg’s SCUM OF THE EARTH. Wow, that is an even better package than I had hoped! Indeed, Grindhouse is setting itself up as the Santa Claus of the indie cult-flick labels.